A good wine will instantly impress. A great wine will stand the test of time. Last week marked the release of Te Motu's flagship cuvée 'Te Motu'. Like a classic album, this wine doesn't need a clever name it's simply, proudly named Te Motu, and quite rightly so. This 'new' release was the 2013 vintage. That's right, 2013. Who keeps wine back for 5 years before release? The Dunleavy's do. After spending some time with the family earlier in the year, third-generation and new manager of the Waiheke estate, Rory Dunleavy reached out to see if I'd like to try the new vintage. I happily agreed (understatement) on one condition, we also try something from the family's cellar with the kind of age they'd recommend cellaring the 2013 for. 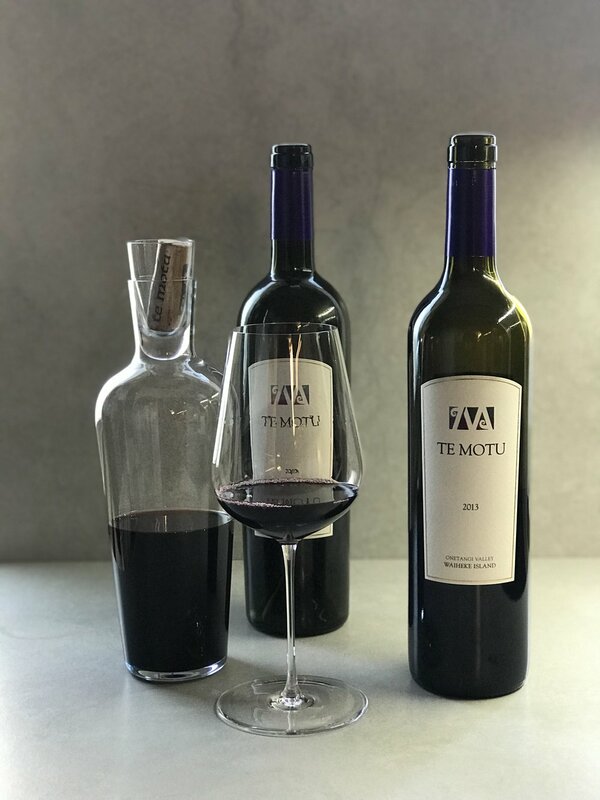 Te Motu from the 2000 vintage was chosen which had similar vintage conditions as the 2013. The evolution was truly impressive, but, we'll get to that in a minute. The Dunleavy name and family is a story that runs almost parallel to the New Zealand wine story. Terry Dunleavy, or Grandpop to Rory, was the inaugural CEO of the New Zealand Wine Institute. "Well, I was the only employee at the time!" - Terry Dunleavy. Rory; far left. Terry holding court. In the most loveable sense of the word, Terry is a character. Most stories centre around the word 'finagling' and you instantly get a feeling for the wit, charm and canny nature of the man that (along with others) had the ability to transform the New Zealand wine industry from producing 'house red' into a world-beating varietal-focused fine wine powerhouse. When it came to establishing Te Motu, Terry's son Paul, father to Rory (keep up!) was the mastermind. Paul made the call to buy a couple of plots of land in a new sub-division in Onetangi Valley, laying the foundations for next generation of Dunleavys to grow up around wine, like he and his brother John did many years before. Paul and vigneron brother John, have run the estate since planting the first vines in 1989, and have grown the label into a world renowned Bordeaux blend. They have now handed the reigns over to both their sons for the 2018 vintage. No pressure lads. Terry, Paul and Rory Dunleavy during planting in 1989. Winemaker Sam Dunleavy has shadowed his father for many years now, taking over to continue his father's life's work and possibly add a few more increments of greatness to the wines. Early indications are he's doing exactly that. Instantly Impressive. Rich, ruby-to-purple in the glass. Bright, dense, currants, cranberry and blackberry aroma, with lovely texture and mouth coating tannins, balanced acid - earthy, cocoa finish. The thing that is slightly mind-boggling about this wine is that you can see the density and structure necessary for it to stand the test of time, but is just so, so good right now. Really good. With the modern generation of drinkers not wanting to wait 18-20 years, this kind of wine will reward both eagerness and patience. On opening the 2000 it was closed-in, muted and hiding. When run though the decanter a few times it opened up like a pop-up book of flavour that just kept on unfolding with every sip. Rich red brick in colour, this regal number is perfumed with dark spices and herbs on the nose with earth tobacco, tea and baked blackberry and quince crumble . The palate is powerfully dry with great acid, mushroom, black-forest, black cherry and ripe juicy plum. A long dancing acid finish of cocoa, graphite and tobacco. There's a linage you can taste in these wines, they are related yet years apart. One opens a window into what it could grow into, much like the Dunleavy's themselves. Chapter 3 of their story is being written as you read this and I'd highly recommend being part of it. But, for now here's Chapter 1 and 2.